Installing gutter protectors is as easy as the 4 simple steps listed below. However, if DIY projects aren’t your cup of tea, you can always call on the experts at North East Home Improvement! Step 1: First, you’ll want to get up underneath the roof shingles that are stuck down. To do so, slide a putty knife underneath and lift up slightly. Then insert gutter protector, making sure it covers the front edge of the gutter. Step 2: Read the manufacturer’s instructions to find out how to fasten the protector to the roof or gutter. If nails or screws are required, cover them up with a dab of roofing cement. Step 3: With any remaining cement, seal down the singles. Step 4: To test out the protector, toss a few dry leaves on the roof. Then spray them with a hose to simulate rain. 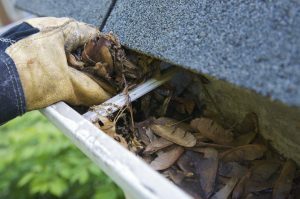 Make sure they wash off of the roof instead of falling into the gutter. North East Home Improvement is the experienced, local choice for gutter installation, maintenance, and repair. We offer professional service at a cost that you won’t shudder to hear. Give us a call today at (203) 321-6695 to find out more about our services.